I’ve been sewing for charity each year as part of a group of stitchers, and it gives us a great feeling to know that our hand-stitched items made with love will give comfort or help to someone in need, no matter where they live. As a group, we’ve donated to some well-established national organizations providing handmade help to people across the USA (Project Linus, Project Night Night, and the Alzheimer’s Art Quilt Initiative just to name a few). This year our group decided to not only help those in need across the nation, but also to look in our very own backyard. And after doing a little digging, we were astonished at how many people in our community can benefit from handmade items, and at how many organizations are desperate to receive our help. In fact, I bet there are places right in your own backyard that would benefit from your handmade donations, too! Here are some tips that can help you find places in your own community that need your help to serve others. Look in your own backyard – literally! If you were to walk around your block (or apartment building, condo, or cul-de-sac) and talk to all of your neighbors, chances are you would find someone who is (or has a family member) in need of a little handmade comfort. Your handmade help could come in many forms, from a bright and cheery pillowcase for an elderly person who is confined to bed, a cozy quilt for someone who might be undergoing cancer treatment, a baby blanket for a new mother, or even a handmade apron to welcome a new neighbor. You’d be surprised at how a small handmade gift can lift someone’s spirits. There are several organizations that, no matter what community they are in, are likely in need of handmade donations. You might also try thinking outside of the normal types of donations, such as blankets for sheltered animals (don’t forget our faithful four-legged friends) or reusable fabric bags for food pantries. Check this list of places to contact that may need donations: animal shelters, Child Welfare Services, children’s hospitals, the Department of Human Services, food banks/pantries, homeless shelters, hospice centers, hospitals, neonatal intensive care units, nursing homes, oncology units, runaway shelters, women’s shelters/domestic abuse shelters, veteran’s clinics/hospitals, and youth shelters. If you do want to sew for charity, but aren’t sure where to find patterns or project instructions for sewing specific items, here are some resources to get you started. Find a whole page of free pillowcase patterns to sew for those in need at the AllPeopleQuilt.com’s 1 Milloin Pillowcase Challenge. And, if you are stitching pillowcases for charity, help out by adding your handmade pillowcases for charity to the tally. TipNut.com posted a whole page full of receiving blanket patterns and tutorials for babies, and you are sure to find one that fits your charity sewing needs. Check out TipNut’s 25+ Baby Blankets to Make. 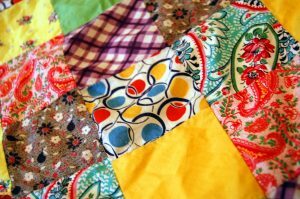 It seems that virtually any quilt pattern will work for charity, but simple to make quilts are the most popular. Better Homes and Gardens has free quilt patterns at their BHG.com website, and so do McCallsQuilting.com, QuiltersNewsletter.com, and even at TipNut.com. People I know seem to have a favorite pattern to sew for charity, and it often is a simple four patch (see a four patch video tutorial from Missouri Star Quilt Company), nine patch (get an online nine patch lesson from ConnectingThreads.com), or simple quilt made from strips (get a free strip quilt pattern from FonsandPorter.com). I hope I’ve inspired you to think about sewing locally as well as supporting the wonderful national charities that accept handmade donations. Happy stitching! I go to a retirement home one day a month, with a group from our church, to mend. We also do alterations. I also go to the hypothermia programs at 3 churches to mend for the homeless. It is a very rewarding experience.